This Spicy Cheesy Broccoli Recipe is the perfect easy side dish for those busy nights. When you're rushing around and on the go, you still need to eat your vegetables! 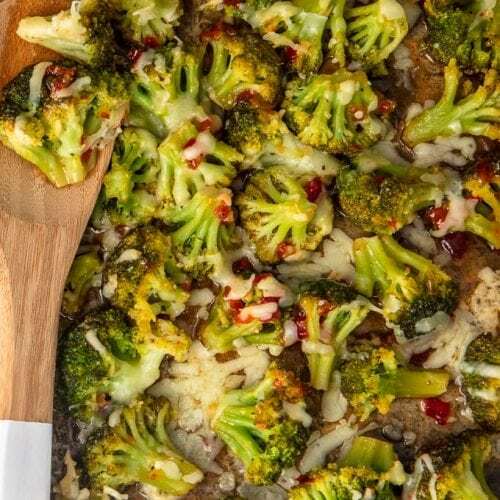 Kids and adults alike will love this Firecracker Broccoli with Cheese that anyone can make, and everyone will love. Cheesy Broccoli is a side dish the entire family will ask for again and again. Chop a 2 heads of broccoli into florets and set aside. In a large bowl, whisk together the oil, sweet chili sauce, sriracha (optional), and lime juice. Add your broccoli in in batches, coating completely in the sauce, and then transfer to a baking sheet and lie in a single layer. Sprinkle with shredded pepper jack cheese. Bake for 20-25 minutes or until charred and cooked to tender.